I have a big problem with program a Jeenode Micro v3. I prepared all like discribed here:[[[http://jeelabs.org/2013/03/21/programming-the-jn%C2%B5-at-last/]]]. I use the Arduino IDE 1.5.4 on Windows and a Jeelabs Flashboard. But the step ‘burning bootloader’ doesn’t work. The Arduino IDE shows this error: Error while burning bootloader: missig ‘erase.params.verbose’ configuration parameter. @wolfpackman2, would I be correct in assuming that U1 on that purple SC70 Work Board is a flavour of the LTC-3525? Must admit as far as the ATTINY84 is concerned, cant see me using it much, if at all, in the future. There does seem to be a lot of confusion around programming the JNMicro. I think whatever guide is put together will be of great benefit to people. In a side note, I believe this will be my first and last ATTiny84 design. Looking on Mouser, the chips are not any cheaper than the ATMega328P, which has many many advantages over the ATTiny84, not the least of which is a broader online knowledge base. The ATTiny84 MAY offer lower power usage, but I’m not entirely certain of that, and the difference may be negligible. henry You don’t actually need to burn the bootloader, as 1) The bootloader is not needed and 2) The Jeenode Micro should have arrived with the proper fuses already set. Burning bootloader is only for setting fuses on the Micro. On the left, a JeeNode USB with Flash Board, on the right a JeeNode SMD (should work similarly with other boards running at 3.3V, e.g. a JeeNode Micro). To program the board on the left (over USB serial) - select the `isp_flash.ino` example sketch from JeeLib, and “Upload” from the File menu (i.e. CMD+U on Mac). To program the board on the right (over ISP, including fuses) - pick the appropriate sketch in the IDE and use “Upload Using Programmer” from the File menu (i.e. CMD+SHIFT+U on Mac). It’s as easy as it gets, and you end up with the ability to program the rightmost unit over ISP - even if the boot loader is missing, or has been damaged somehow. PS. The explanation for this, is that the leftmost unit emulates an ISP programmer when spoken to at 19200 baud, but OptiBoot still kicks in when spoken to at 115200 baud. PPS. You don’t strictly need the Flash Board, you can also wire things up yourself, as documented on the JeeLabs weblog in various posts. Note that the leftmost unit also powers the rightmost unit in this setup. wolfpackmars2, would you be willing to share the pcb design for your dev board? Or the schematic? @JohnO, can you take a picture of your JeeNode Micro connected to your favorite programmer and share that with me? jcw Thanks for joining the discussion. Thank you for updating the JeeLib library. I will be sure to update my local repository with your fixes. You probably saw my earlier posts which state I forked your jcw/ide-hardware code. I’m in the process of updating that now, I am particularly interested writing a guide to programming the JeeNode Micro that comes complete with photos. This is why I’m asking JohnO, wolfpackmars2, and other interested parties to share their photos and thoughts with me. If you like I will be happy to add your post just above to the web page documentation I’m starting to think about. Eventually — I will send you a pull request for jcw/ide-hardware which you may find helpful. Guys, it is getting close to the “Thanksgiving” holiday here in the USA, and I’ll be slow to work with this thread. But I’m monitoring it closely. Every post here goes straight to my cell phone. @Bob, enjoy the turkey and cranberry sauce ! wondering if there is a possible pun in there somewhere? plutonomore, yes I am interested in the clone. I remember reading about it — I think either JohnO or wolfpackmars2 posted the actual photo but I am not sure. I too am wondering if martynj is punning a bit. It definitely brings a big smile to me! This Thanksgiving, I am both serving a fish pie (using a recipe published by BBC, no less) and I am fishing for JeeNode Micro knowledge. plutonomore, I’m confused by the clone now. The photo you posted is lovely — is this your clone? Who built that clone, do you know? > I no longer like the USTinyISPv2 because of the provisions required to avoid 5v hitting the RFM12B. I have a standalone RFM12B board that I’ve connected to an older “Really Bare Bones Board” (RBBB) which I purchased long ago from either Wulfden or directly from Modern Device. Your comment made me go back to that RBBB device and look more closely at the connections to the RFM12B. The +5v and ground from the RBBB is connected to the RFM12B…(Bob winces.) The absolute maximum voltage for the RFM12B is 7v, so maybe I haven’t wrecked it yet. I am planning to order some new Really Bare Bones Boards from Modern Device as Christmas presents for my team members at my day job, and I guess I will need to add one more 3.3v device to the order. The RFM12B spec sheet has Absolute Maximum Ratings (non-operating) Vdd at 6.0V, Recommended Operating Range 2.2-3.8V. They do appear to tolerate 5V, but Absolute Max ratings come with the usual dire warning of potential limited life etc. BTW, the RBBB is available in a 3.3V version (same board, different LDO output). martynj, I stand corrected about the Absolute Maximum Rating for Vdd. Indeed it is 6.0v. Yes, the RBBB is available in a 3.3v version. I better start using one for the RFM12B hookup. Your comment about the Turkey and the Tiny gave me a really good laugh which I appreciate! > I better start using (a 3.3V version RBBB) for the RFM12B hookup. Bob, Yes, the photo is of my clone! The ATTINY84V fuses were set as follows: lfuse 0xc2 hfuse 0xde efuse 0xff using USBasp v2 ISP programmer. the USBasp programmer six pin socket to the six pin ICSP header on the ATTINY84 pcb. syntax to burn the hex file to the ATTINY84V, avrdude -v -p t84 -c usbasp -U flash:w:Matts_DHT22e1.cpp.hex. provided. Am attaching two sketches which I have tested with this unit succesfully, Matts_DHT22e1 and Matts_DS18B20a. of the setup. Good luck ! That is one monster of an AA battery 3000mAh. @Bob here are your photographs, I hope the file-names provide a sufficient explanation. It took me a while to learn not to solder on headers on these small circuits until the final installation was clear(ish). Wow! I am so pleased! I’m going to put all these photos in my GitHub fork. I’m really focused on adventures with fish pie today and tomorrow, and need to prepare for visitors…so I will get to this on Friday. My plan is still to build a web page that showcases your photos and your comments. I think it will be a great help to others. @plotonomore, your board is beautiful. I hope to achieve the same level of skill in devising a circuit some day. Thanks to this thread I’ve managed to set fuses and program my JeeNode Micro! Firstly kudos to jcw and the team for the whole JeeLabs project, amazing stuff! And thanks to Henry, JohnO, Bob, wolfpackmars2, plutonomore and all the others for this thread. Firstly I used an Arduino Uno r3 to try to program with, I was only able to upload a bootloader and thereby set fuses with it, I couldn’t get uploading sketches to work, despite using the boards and platforms for henry files that worked for others. I also messed around with the capacitor into the reset line, added a resistor to +5v from reset as well, then put some resistors in in case the 5v logic levels were the problem. None of which seemed to work, and after fiddling round with various permutations I was just left confused as to what I was doing. So eventually I decided to give up on trying to do the programming with the Arduino and dug out an old USBasp that I had been given a couple of years ago. After creating a udev rule for it and updating the firmware on it I was able to move over to using this as a programmer with eventual success. I’ve rigged up a custom cable to link the programmer’s ten pin isp header with the Jeenode, photo attached. The ugly part is the voltage supply where I took the 5v from the USBasp and put that into the arduino’s Vin. Then I took 3.3v from the arduino and used that to power the JeeNode. That way I’m using the arduino purely as a voltage regulator (as it’s convenient and low current I seem to have got away with it). If I had a better quality USBasp device it would provide an onboard voltage converter for both the power and the logic levels. I did worry about the logic voltage level as the device seems to be at 5v and the JeeNode uses 3.3v but it seemed to work! I suppose the JeeNode is quite tolerant of over voltage? And avrdude responds with loads of useful info confirming it worked. Which means I can move on to programming with the USBasp. When I set the arduino IDE to use the USBasp as a programmer and the JeeNode Micro as the target board, I can upload sketches by using the ‘Upload Using Programmer’ option. And now I’ve written it out I can’t believe it took me so long, because I’ve double checked my steps just now using my laptop as a fresh start, it really was that straightforward! This is a great post and I would like to include it in my eventual “manual” for working with the JeeNode Micro. The photo is really clear, it should show a beginner how to set this up. Setting up the IDC header must have been a bit challenging. I always seem to rip the wires apart and/or get them in the connector wrong. 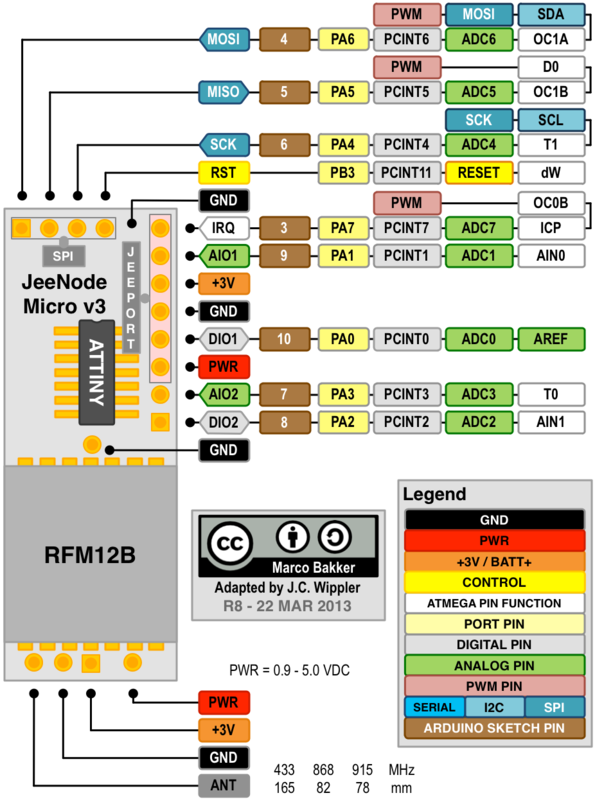 JeeLabs publishes a reference sheet for the JeeNode Micro ( http://jeelabs.org/wp-content/uploads/2013/03/qrc-jm-v3-part2.png ) which lists the PWR pins as being 0.9 - 5.0v compliant. The Atmel datasheet for the ATTINY84 says voltages up to 5.5v are okay. I did not check the “Absolute Naximum Values”. Page 153 of Atmel datasheet starts a long section on programming the chip in various ways, which I have not yet read but need to. Does the Arduino Uno r3 have the latest Optiboot bootloader on it? Or at least, a version of the bootloader that the Arduino IDE understands? Can you provide the exact UDEV rule that you used? Also, what version of the USBAsp do you have? This is a great post! I’m glad you are having progress with your JeeNodeMicro. I spent most of yesterday translating the Adafruit ADS1X15 library to be compatible with the Jeelib i2c implementation. Hopefully it will serve as an example to anyone who wants to imlement i2c using the JM Micro. > This is a great post and I would like to include it in my eventual “manual” for working with the JeeNode Micro. The photo is really clear, it should show a beginner how to set this up. Setting up the IDC header must have been a bit challenging. I always seem to rip the wires apart and/or get them in the connector wrong. Yes, in my experience IDE headers only work well with the correct pitch ribbon cable - single fly wires can give problems. In my case I had a ‘stub’ of ribbon cable and a header plug that came with the unit. Photos attached to make it clear which wires go where (note polarising notch visible on top of the connector). > JeeLabs publishes a reference sheet for the JeeNode Micro ( http://jeelabs.org/wp-content/uploads/2013/03/qrc-jm-v3-part2.png ) which lists the PWR pins as being 0.9 - 5.0v compliant. The Atmel datasheet for the ATTINY84 says voltages up to 5.5v are okay. I did not check the “Absolute Naximum Values”. Page 153 of Atmel datasheet starts a long section on programming the chip in various ways, which I have not yet read but need to. I should have been clear that I’ve got the version without boost converter as I’m intending it to be powered by a pair of AA batteries. So I understood that the voltage accepted was 2.2-3.8v. > Does the Arduino Uno r3 have the latest Optiboot bootloader on it? Or at least, a version of the bootloader that the Arduino IDE understands? > Can you provide the exact UDEV rule that you used? Also, what version of the USBAsp do you have? The USBasp isn’t branded but seems to be a fairly faithful clone of Thomas Fischl’s classic design, you can see from the photo all the info I have. I assumed it to have the standard 10 pin ISP pinout, and it’s worked so far. > This is a great post! I’m glad you are having progress with your JeeNodeMicro. Thanks Bob, looking forward to you gathering it together with the others. Now I need to get it talking to the raspberry pi…. > I spent most of yesterday translating the Adafruit ADS1X15 library to be compatible with the Jeelib i2c implementation. Hopefully it will serve as an example to anyone who wants to imlement i2c using the JM Micro. That’s really interesting as it is very close to what I want to do - interface the adafruit TSL2561 i2c light level sensor to a jeenode micro and see how long it can run on a pair of AA’s. Have you got any idea of the power consumption? Are you employing any tricks around sleeping between measurements, turning the radio off etc? > That’s really interesting as it is very close to what I want to do - interface the adafruit TSL2561 i2c light level sensor to a jeenode micro and see how long it can run on a pair of AA’s. > Have you got any idea of the power consumption? Are you employing any tricks around sleeping between measurements, turning the radio off etc?